Children and nature go hand in hand, or at least it should. Research has shown how important it is to introduce children to nature especially in the early years. Children today, especially our inner city children have a very limited opportunity to connect with nature. How can we teach our children the importance of our environment if they have a disconnect with nature? This became our goal when we introduced the children in the Butterfly classroom at Kinder Academy to the Schuylkill Center for Environmental Education’s Nature Preschool. 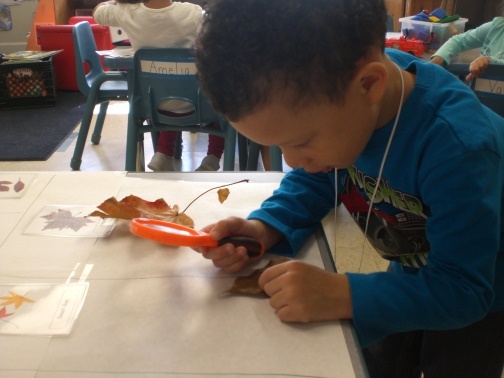 Nature Preschool is a fabulous program where children can learn about nature as well as learn about themselves as they investigate and make new discoveries. We wanted our children to be able to experience nature first hand, and learn from children in their own age group. We met with the teachers at the Schuylkill Center back in 2014, and we knew right away that this was going to be an experience of a life time and we could hardly wait to become involved. Our children met their Nature Buddies for the first time in October 2015. There was an immediate connection. It had rained very hard the day before our first visit, and there were puddles; many puddles. Because our children are from the city, they were taught to not walk through a puddle, but at the Schuylkill Center, there is a totally different mind frame. If there’s a puddle, it must be walked through! 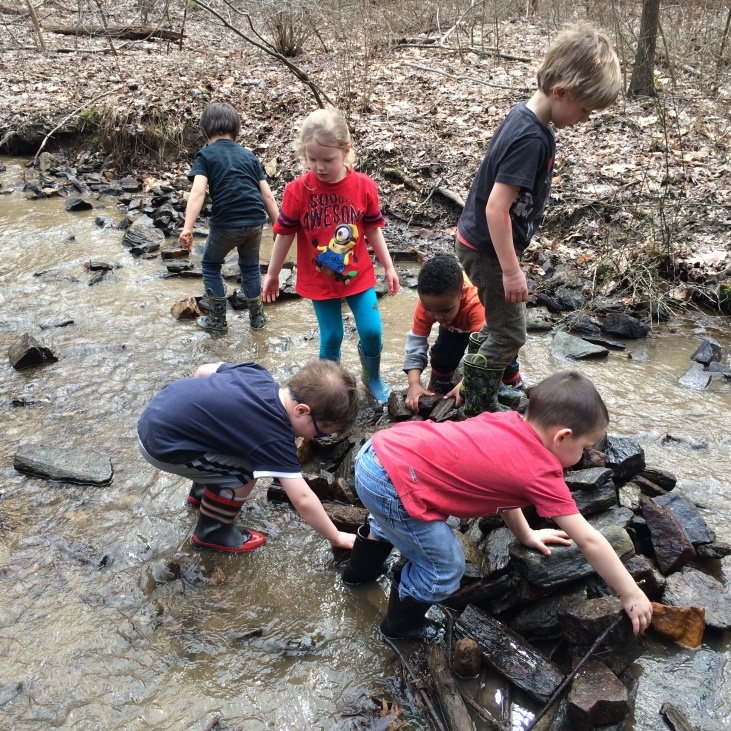 Our children loved this idea, and walked through each and every puddle; not once, but many times! Playing in mud? Well, it was acceptable, and fun! Our children learned about different bugs and plants, but they also gained social skills by learning how to work together as a group. They had to come up with a plan and as they worked, they communicated how to build a structure together. We are creating future Engineers! The children also developed and gained language skills. As they played in the creek, they learned how dams are built, they learned about ‘duck weed’, the growth of a Polliwog, and so much more! Every trip brought new discoveries. Throughout the day you could hear the children shout out the phrase, “Stop in the name of Discovery!” The children would scurry around to see what the new discovery would be. Many of our children were timid around bugs, and their first reaction was to step on it. But they discovered, through learning, that bugs are valuable to our environment. They came to enjoy observing bugs, and many of them felt confident enough to hold them. Because our trips to the Schuylkill Center were rain or shine, the children were able to experience nature during the different seasons. This enabled the children to get a hands on view of how our environment changes and how new growth occurs in the spring. We were able to visit the Polliwog Pond in the winter as well as the spring. When we had the opportunity to do so, we were able to bring our discoveries back to school with us so that could expand our knowledge and learning. On one trip to Founders Grove, we collected small sticks. Back at school, we examined the sticks, talked about how they looked, smelled and felt similar or different. We sorted the sticks by length. We tied them together and hung them in our classroom. We discovered seed pods from a honey locust tree. The seed pods are long and curly, and the children were full of curiosity. We brought them back to school and researched all about the seed pods. We painted the pods, and hung them in our classroom. We collected leaves of many colors and shapes. We used the computer to help us classify the leaves. We used magnifying glasses to help in our investigations. We had the opportunity to observe birds. The children were very curious about owls. We read books and learned all about owls. We were able to order owl pellets, which gave us the opportunity to examine them and to dissect them. We learned so much! 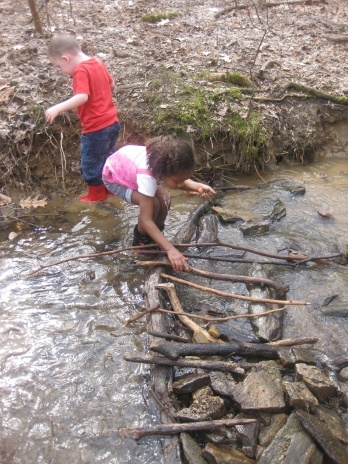 It has been well documented that the benefits of connecting with nature supports multiple developmental domains. According to the Natural Learning Initiative at NC University, “children’s social, psychological, academic and physical health is positively impacted when they have a daily contact with nature.” This exposure to nature also increases children’s ability to focus, enhances cognitive abilities, supports creativity and problem solving. As a teacher, I feel privileged that we have had the opportunity to bring several of our children to the Schuylkill Center. Without this program, many of them would not have had the experience of learning about nature and the environment. I am hopeful that we can continue this incredible program and give many more children the opportunity of a lifetime. This entry was posted in Education, Nature Preschool. Bookmark the permalink. I really like your post.The selection of your topic most relevant topic.Nowadays most of the students don’t know the importance of nature and this post is useful for understanding how important it is to introduce with children .